There are three possible sources for this intriguing surname of Anglo-Saxon origin, the first being that it is locational from East and West Winch in Norfolk, and as such derives from the Olde English pre 7th Century "wynn", a meadow, and "wic", a dairy farm. These places are recorded in the Domesday Book of 1086, as "Eastuuininc", and "Wesuuenic". However, Winch and its variants Wynch, Wink and Winks, may also be a topographical name for a person living by a well from which water is drawn by means of a winch, deriving from the Olde English "wince", a winch or pulley. 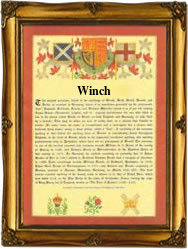 Lastly, 'Winch' may be a nickname surname from the Olde English "hleapewince", meaning lapwing, and given to someone with some fancied resemblance to the bird.Examples of early recordings taken from church registers include Elizabeth Winche christened at St Lawrence Poultrey, London, on September 10th 1598, and Bennet Winch, a witness at St Martins in the Field, Westminster, on January 17th 1654, during the 'reign' of Oliver Cromwell. Sir Humphrey Winch was a member of Charles 11 Council for Foreign Plantations in 1671, and as such received a salary of 500L, equivalent to about 200,000 pounds p.a. in 1990 values. The first recorded spelling of the family name is shown to be that of Walter Winch, which was dated 1189, in the "Pipe Rolls of Cambridgeshire", during the reign of King Richard 1, known as "The Lionheart", 1189 - 1199. Surnames became necessary when governments introduced personal taxation. In England this was known as Poll Tax. Throughout the centuries, surnames in every country have continued to "develop" often leading to astonishing variants of the original spelling.